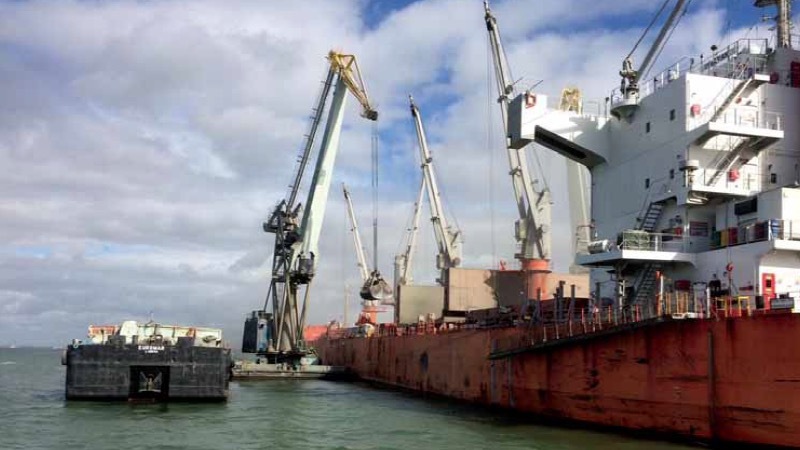 GRUPO ETE enabled the largest Portuguese clinker export ever, for its client Cimpor — an InterCement company — by concluding successfully the loading of 55,902 tonnes on the Vinayak bulk carrier, bound for Ghana. This export operation, completed in a record time, was entirely carried out on the Tagus river. The clinker was trans- ported in barges pushed by tugboats down the river, from Cimpor’s Alhandra plant terminal, and loaded by floating cranes into the Vinayak anchored midstream in the port of Lisbon. In total, two floating cranes, three tugboats, and 23 barge voyages were used in this operation. In Portugal, GRUPO ETE, the only company doing inland waterways transport and performing midstream at anchor loading and unloading operations, handles more than 25 clinker vessels per year exceeding the one million tonne mark. Exceptional natural conditions of the Port of Lisbon associated with the navigability of the Tagus river allow sustainable and environmentally friendly operations. The Port of Lisbon’s natural conditions mean it is possible to accommodate large vessels like the Vinayak. The port’s location in the Tagus estuary — one of the few Portuguese rivers allowing inland cargo transportation — offers all industries settled along the river up to 60km from the mouth of the Tagus the opportunity to benefit from the competitive and environ- mentally friendly inland waterway mode of transportation. This sole clinker operation took 2,300 trucks off the roads, and saved 54 tonnes in carbon dioxide emissions. All Cimpor’s clinker exports are carried out by inland waterways, using the midstream cargo operation in the Port of Lisbon, thus offering important environmental advantages. Lui´s Figueiredo, GRUPO ETE shareholder and board member states that “Challenging clients like Cimpor make us settle transport solutions that add additional competitiveness to these operations, and using the Tagus River is key to this process. Thus, fostering inland navigation will contribute to boosting the Port of Lisbon’s development and potentiate the geostrategic value it offers to the Portuguese economy and export companies,” he adds. Cimpor, an InterCement company, is among the ten major world cement producers. Its production units located in South America, Africa and Europe have a total production capacity of 48 million tonnes per year, as the company is a market leader in Argentina, Portugal, Mozambique and Cape Verde, second in markets like Brazil and Paraguay and with a strong regional leadership in South Africa and Egypt. Additionally, due to its strong export operations Cimpor has a major position amongst the largest cement traders in the world. Founded in 1936, ETE GROUP is the most experienced and largest Portuguese player in the maritime sector, integrating its six main areas — Port Operations, Inland Transport, Shipping, Shipping Agents, Logistic Operations, Engineering and Naval Repair. It owns the largest Portuguese cargo shipping company; is the Iberian leader in inland water transport; in Portugal is the largest operator of port terminals and concessions; is a highly respected shipping agency in Portuguese ports; offers door-to- door multimodal national and international logistics solutions; is a reference in engineering, naval repair and shipbuilding; and also provides technical management services of ships and crews. It has an international presence with its own operations in five countries (Colombia, Uruguay, Cape Verde, Mozambique and Portugal) over three continents.